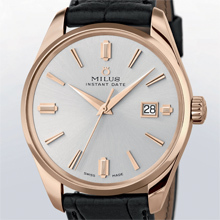 The tradition-rich Swiss brand Milus takes up one of the most illustrious pages in its history and repeats in two limited editions, one in 18 carat red gold, the other in steel, the watch that it supplied to the US Navy throughout the World War II for inclusion in the “Life Barter Kit” issued to the navy pilots. A kit made up of numerous precious objects and which, in these troubled times, no doubt saved numerous lives. 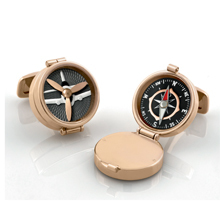 Each item is presented in a box where it is accompanied by a pair of cufflinks. These objects included two rings, a chain and a gold pendant as well as a Snow Star watch signed Milus. In 2011, Milus has decided to again take up this page, regarded as one of the most illustrious in its history, with an identical model to the Snow Star in two limited editions: one in steel and the other in 18 carat red gold. The watch in 18 carat red gold has been produced in 99 numbered copies. Its polished case, with a diameter of 40 mm, is water-resistant to 3 atm and houses a contemporary movement, a mechanical ETA 2408 with hand winding. Finding 99 copies in working condition kept the Milus technical team occupied for several months. Each of these copies was then subjected to a complete overhaul and reconditioning. This movement has hour, minute, large second functions in the centre and a calendar. 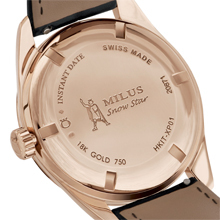 On the assembly side, the screwed-on back cover is an identical reflection of the aesthetics of the original watch: sanded and polished finish, engraving of the name of the model “Milus Snow Star” and of the historical Milus logo, a Roman wearing a crown, brandishing his sword and with his right hand raised. The dial, identical to that of the version in the “Life Barter Kit,” is a refinement of details. Its back cover is brushed, sunned and silver-plated. Particularly legible, it is decorated with two types of index gilded in red gold: those at 3, 6, 9 and 12 o’clock combine a central lined part which underlines a cruciform, bevelled and mirror-polished turn. The eight others, trapezoid in shape, have a flat and polished upper surface which is brought out by the play on light created by a central V-shaped groove. The watch features a black alligator bracelet with a buckle in 18 carat red gold and an interchange system that avoids the need for tools. It also includes a second NATO strap with vintage accents in black nylon. In order to recall the original “Life Barter Kit,” Milus wanted to equip the Snow Star watch in red gold with a valuable jewel which is masculine and directly associated with the world of aviation. The choice thus fell on a pair of cufflinks likewise in red gold. These two jewels, elegant and refined, have been given a particularly clever construction. In effect they have been designed in the form of two miniscule boxes, one containing a compass, an indispensable instrument for piloting aircraft, the other housing which can be used as a secret box. The cover of these boxes features external decor representing an aeroplane seen from the front, an aircraft equipped with a genuine propeller in massive gold. When this mobile propeller starts to turn, thanks to movements of the wrist, the effect is striking. The whole thing is protected by a sapphire glass. The Snow Star watch in 18 carat red gold and its cufflinks are presented in an elegant box covered in leather. The steel version has been produced in 1940 numbered copies. Even if most of its characteristics are identical to those of the model in 18 carat red gold, it nevertheless differs in terms of its movement, a Swiss mechanical calibre with hand winding. This steel version offers hour, minute and second functions in the centre and a calendar. The model also has a specific dial with rhodium-plated index. Finally, it features a black calfskin bracelet and is also accompanied by a NATO strap. Like the model in red gold, the steel version is supplied with a pair of cufflinks – also in steel. Each of them displays a genuine compass on its upper face. The complete product is presented in a case of vintage inspiration. Old ETA 2408 movement, mechanical with hand winding, completely overhauled and reconditioned. Power reserve of 36 hours. In 18K red gold 5N, polished, diameter 40mm, sapphire glass with eyeglass at 3 o’clock; screwed-on back. Crown with Milus symbol. Silver-plated dial with sun decoration. Facetted red gold coloured indexes. Fitted date aperture, in applique. Seconds hand diamond polished flat, red gold coloured. Hour and minute hands diamond polished, faceted, red gold coloured. Black alligator (20/18 mm), stitching tone-in-tone, equipped with barrettes with integrated catch making it possible to detach it from the case without tool, and with buckle in 18 carat red gold. NATO strap in black nylon with buckle in steel. One features a compass, the other a housing which can serve as a secret box. The cover of each of the cufflinks is decorated by an aeroplane whose propeller, in 18K gold, moves with the turn of the wrist, protected by a sapphire glass.